Whew! What a week, guys. Our little love pup was not-so-lovingly bitten by something in the backyard (probably a snake), and it's been vets, tests, emergency visits, lack of sleep, and tears that have gotten me this far. Thankfully, Xena's okay now, and she's quietly sleeping at the foot of my desk as I type this. She also has found the strength to finally eat, and she's also hobbling around and trying to play with her ball, of all things. You gotta get your strength back somehow, baby! 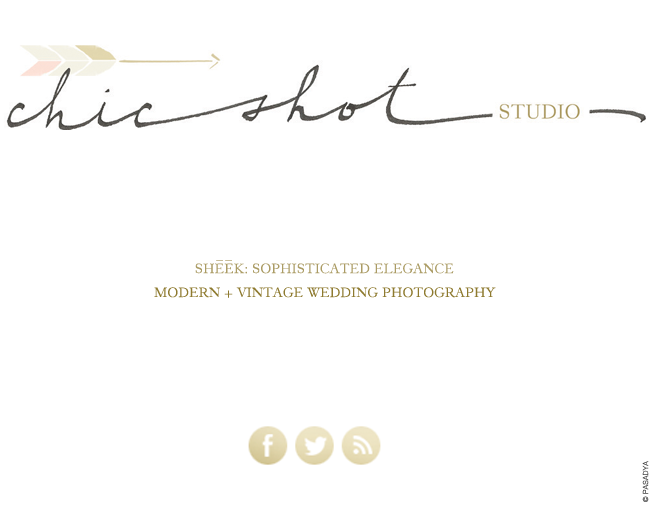 In other news, I've been going all over the place finishing up the Chic Shot Studio logo, and here we are, finally! I'm just over the moon with the results. Mere has been one of my dearest friends since college, even when I was jealous of her mad rendering skills in the studio. I remember walking into the studio the morning our first project ever was due (a mounted draft of a small apartment), and I noticed a pretty project on the table that was so detailed, there were even candles shown on top of the tables in the floor plan. Yes, that was Mere's drawing, and it was the first time I met her as a freshman in college. We both realized that we loved drawing, studying, and utterly pushing for excellence. You can imagine how quickly we became glued together. We've been through bad breakups together, witnessed each other falling in love with our now husbands, and have stepped out of our comfort zones to form careers that we truly love. I couldn't be prouder to have had the opportunity to collaborate with Mere and her husband Jeremiah to strengthen their photography brand. I gotta say though, their work speaks for itself. So much so that Clay and I were absolutely ecstatic to have them photograph our own wedding. Chic Shot needed a new logo, updated social media icons, redesigned gallery notes for client reviews, business cards, and watermarks to protect their work. I had a ball designing each and every one. You guys HAVE to check out their work…especially a recent wedding they just shot. It's hard for me not to drool a little bit…okay, everywhere, to be honest. If you're wanting beautiful photos, these two sweet people are the right ones to go with, no doubt. Thanks so much for letting me take the reins on something so near to your hearts, Mere and Jeremiah! It's bittersweet to say that I'm finished with such an inspiring project. Hey Kristen! Thanks so much! It was a good project.